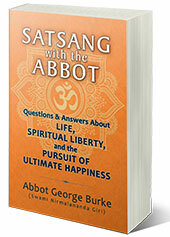 In this new series of podcasts about Swami Sivananda, Abbot George relates his memories in a much fuller form than in previous podcasts. Click here to listen to I Meet Swami Sivananda of Rishikesh if you do not see the player above. The podcast length is 14:32 minutes. I met God in flesh both in America and India in the form of great yogis and devotees. Transformed by yoga and devotion they were embodiments of higher consciousness. One time my friend Hari Datta Vasudev was telling me about some of the holy ones he had met during his life. After one account he paused and then looked at me very intently. “They are the glory of India!” he told me. I agree and would like to tell you of the glory of India I encountered, the glory of God revealed in humanity. The greatest of these was Swami Sivananda of Rishikesh, a holy city in the Himalayan foothills about twenty miles north of Hardwar, another most sacred place. Truly in a class by himself, Sivananda was the Lord of life and death, holding the keys of immortality. Although I could describe the other holy ones to some degree, Sivanandaji was beyond description or classification. He loved and we loved in return. I do not think even his closest disciples could say any more. I met many great yogis in India but among them Sivananda was unique. The other yogis, great as they were, yet produced in me an external awareness, the awareness of their vibration, their very high energy. Now that awareness was certainly beneficial, but in a lesser degree, because it was outwardly turned and reality is inside. Sivananda was glorious and a wonder beyond telling, as was always evident. Yet, I found that the moment I entered his presence I experienced silence and became increasingly self-aware rather than drawn outward. I saw and admired him from the base of my true Self. There is a lot of talk about being centered, but Sivananda’s presence made me centered in the silent core of my being that is pure consciousness. This podcast is the first of a series recounting my time with Swami Sivananda in the early 60’s, beginning with how I first heard Sivanandaji, and how I first met him. Listen to I Meet Swami Sivananda of Rishikesh now. Listen to more podcasts on meditation and living the Yoga Life.